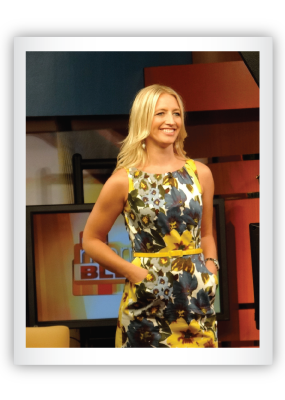 With over 50 TV guest appearances in the last year, Amanda, the bizgal is recognized as a favorite media guest for her savvy expertise, unstoppable energy and contagious enthusiasm when presenting career and image advice. As an expert guest on your morning or afternoon show, Amanda provides a dynamic and engaging approach to today’s hot career topics of personal branding, networking, and building successful career relationships. She’s engaging and brings an unforgettable energy to your broadcast. Always polished with witty banter, Amanda addresses topics emerging from the technology addicted Gen Yers—focusing on issues ranging from reputation management to revitalizing soft skills to maximizing those first seven seconds as a polished pro. Amanda makes your job as producer or anchor easier by providing well-researched and topical talking points. “I wanted to take a minute to show how much the TMC Mega Raffle benefited from working with Amanda. Her enthusiasm for the project was genuine and totally came across that way during the segments we did together. I was really impressed with how quickly she understood the project as well as the lengths she would go to to keep the questions fresh and on point. *Please contact Amanda at amanda@bizme.biz to book her on your next show!